Need to learn a new program or brush-up on an old one? Try online video learning at VTC (Virtual Training Company). Started in 1996, VTC has created the largest online video training collection … over 81,000 videos all available streaming through your web browser covering Adobe Suites, Microsoft Office, Design, Programming and more. So much does this cost? Only $30 a month for the online courses. You can sign-up for just one month and have unlimited access to their entire online catalog. You can even cancel at anytime after the month. No obligation, no enrollment fee. They even have discounts available for longer commitments (ex. annual rate is $250). Want to take it with you? No problem. Most of their courses are also available on DVD for $100 (one time purchase). With small chapters and even bookmarking, VTC makes it easy to brush-up on a topic at work or at home or anywhere with internet access. 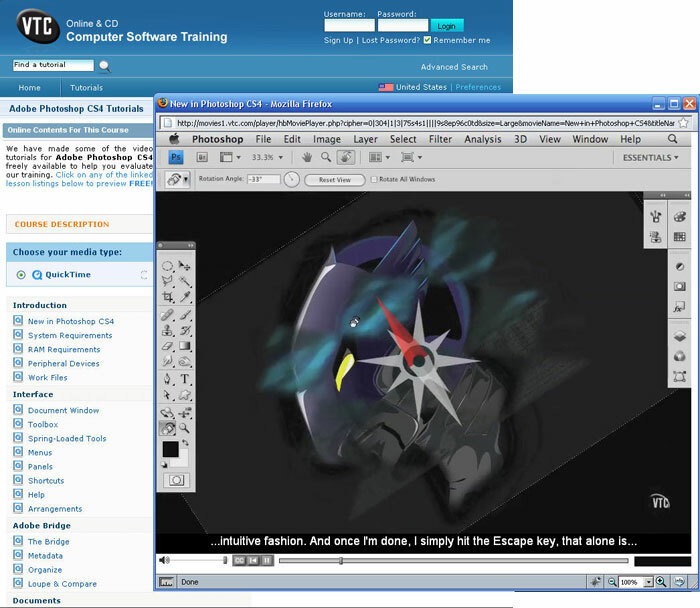 It’s a great way to learn all those new features in the Adobe CS4 suite! Give it a try. The coupon was valid in May 2009. I am not sure if it will still work. Good luck!